Ahoy Mateys! 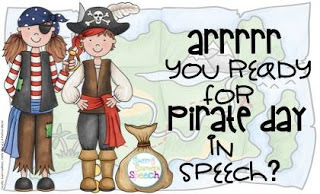 Today some us are linking up to bring you some fun speech/language therapy ideas for Pirate Day, which happens September 19th. sound. Click on the image below to go and grab this freebie! Easy craft idea: Use a paper towel cardboard insert to make a spyglass. Kids can decorate it with construction paper, markers, stickers, etc. Or you can keep it very simple and not decorate it at all. See how many artic cards they they can spy and say using their scopes, especially those RRRR sounds! 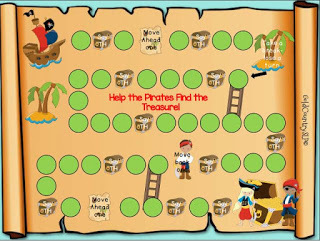 If you are looking for more pirate activities, take a look in my store. 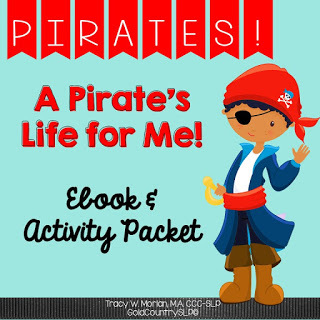 I have several, including an eBook that I wrote with companion activities! Love the map! How fun! I'm actually going to extend it to Pirate Week and 1/2!!! Love the idea of the spyglass! Oooh, the kids will love the spyglass idea! What a fun way to practice.